Shallow very-low-frequency earthquakes (sVLFEs) and slow slip events (SSEs)*1 arise from the same fault slip and that very-low-frequency earthquakes (VLFEs)*2 represent relatively high-frequency fluctuations of slip during slow slip events, according to a research led by Dr. Masaru Nakano at the Japan Agency for Marine-Earth Science and Technology (JAMSTEC: president, Asahiko Taira). Recent studies of slow earthquakes*3 along plate boundaries have shown that tectonic tremor, low-frequency earthquakes (LFEs), VLFEs and SSEs often accompany each other and appear to share common source faults. However, the source processes of slow events occurring in the shallow parts of plate boundaries have not been figured out from studies based on seismic observations at land-based stations, from which images of sufficient resolution beneath offshore plate boundaries are not available. To investigate sVLFEs in detail, scientists used data obtained from a seafloor observation network, the Dense Ocean-floor Network system for Earthquakes and Tsunamis (DONET)*4 installed along the Nankai trough, southwest of Japan. These data were then compared with signals indicative of shallow SSEs concurrently occurring with the sVLFE activity, which were detected by geodetic observations at seafloor long-term borehole observation system*5 in the same region. The results have revealed that sVLFEs and SSEs share common source fault there and almost identical time histories of moment release, namely the fault slip. It is already known that sVLFEs occur along the Nankai Trough over a wide range including off Muroto Cape, Hyuga-nada and Ryukyu Trench. 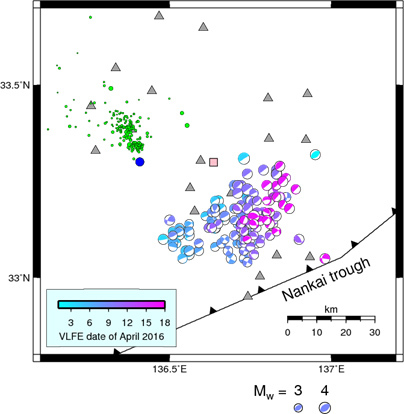 By clarifying the relationship between sVLFEs and SSEs at the plate boundary, this study also suggests that shallow SSEs are occurring repeatedly in a wide area along the shallow parts of the Nankai Trough. Shallow SSEs are likely to be related to strain accumulation, which could result in megathrust earthquakes. It is, therefore, required to monitor SSEs more carefully and investigate generation processes of various types of slow earthquakes along plate boundaries with more detailed observations and analyses. This study project was partly supported by JPS KAKENHI Grant Number JP16H06477. The above results were published in Nature Communications on March 14, 2018 (JST). *1 SSE (slow slip event): Slow slip event is a fault slip lasting over days to years. 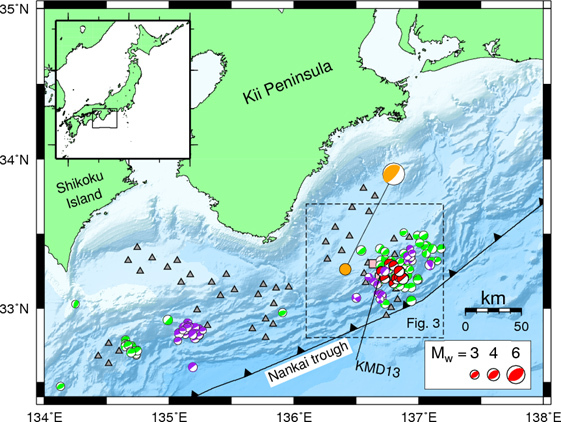 Recently, a research team led by Dr. Eiichiro Araki at JAMSTEC found that eight slow slip events occurred every 8 to 15 months on shallow parts of the plate interface off the Kii Peninsula during 2011-2016. *2 VLFE (very low frequency earthquake): In contrast to ordinary earthquakes, VLFEs show slower fault slips, being enriched in low frequency components (several ten to hundred seconds). In Japan, VLFEs have been detected in shallow parts of the plate boundaries under the accretionary prisms near the Nankai Trough, which is known as focal regions of megathrust earthquakes. VLFEs also occur at depths about 30km near plate boundaries. *3 Slow earthquakes: Slow earthquakes are considered to arise from fault slips slower than ordinary earthquakes. There are various types of slow earthquakes: low frequency earthquake (LFE); very low frequency earthquake (VLFE) and slow slip event (SSE). *4 Dense Ocean-floor Network System for Earthquakes and Tsunamis (DONET): DONET is a submarine cabled real-time seafloor observatory network for the precise earthquake and tsunami monitoring. Started its operation in 2011, DONET1 is deployed at the depths of 1,900 - 4,400m in the Kumano-nada, while DONET2 is installed at the depths of 1,100 - 3,600m along off Cape Shiono-misaki to Cape Muroto-misaki. Each station has a broadband seismometer, a strong-motion seismometer, a hydrophone, an absolute pressure gauge and a differential pressure gauge. With completion of DONET2, DONET was transferred to the National Research Institute for Earth Science and Disaster Resilience. Real-time data are transmitted also to the Japan Meteorological Agency for emergency earthquake warnings and tsunami alerts. The long-term borehole monitoring system was developed by JAMSTEC to obtain real-time seismic data for the observation of seismogenic faults. Along the Nankai Trough, three LTBMS sites have been installed within boreholes drilled by the D/V Chikyu. By connecting to the DONET backbone cable, real-time observations are achieved. Fig. 1. Locations of the observation network and sVLFEs along the Nankai trough. Gray triangles indicate DONET stations while the pink squares are borehole stations. White circles with green, red and purple indicate sVLFEs occurred in 2003 and 2004, 2009, and 2015, respectively (according to previous studies). A white with orange color circle indicates the epicenter of the 2016 Off-Mie earthquake on April 1. Figure 2. 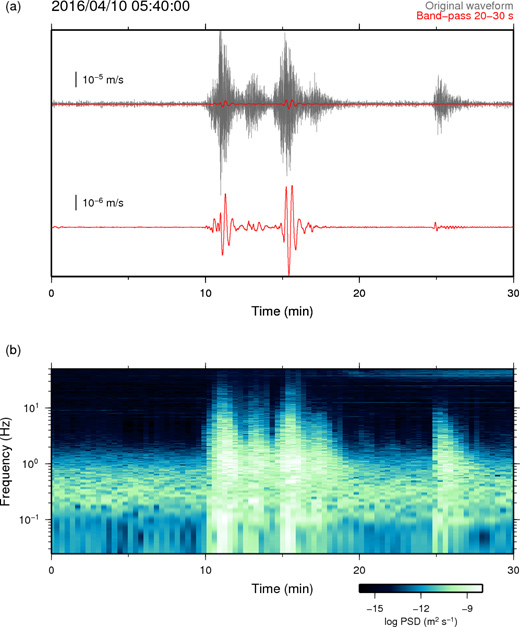 An example of sVLFE burst activity in vertical component seismograms. (a) Gray and red waveforms represent the original waveform and long-period (band-passed 20–30 seconds) components, respectively, at station KMD13 (location shown in Fig. 1). (b) Running spectrum of the waveform shown in (a). The brighter the color is, the stronger the signal is. sVLFEs contain signals from several ten seconds to 10Hz. Figure 3. Spatiotemporal distribution of sVLFEs occurred in Kumano-nada in April, 2016. Colors indicate sVLFE occurrence dates. Circles show locations of the mainshock of the 2016 Off-Mie earthquake (blue) and aftershocks (green). The sLVFE areas are moving from deep to shallow parts as the time passes. Figure 4. Comparison of sVLFE cumulative moment and borehole pore pressure. Cumulative moment represent total fault slip of sVLFEs. Pore-pressure change is proportional to fault slip during slow slip events. 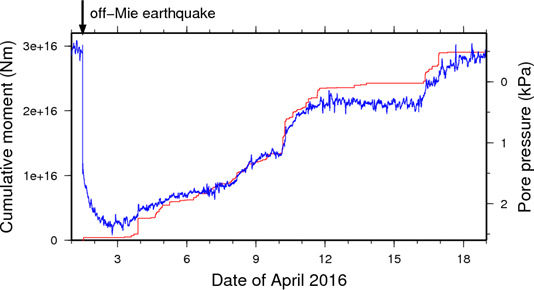 These values show very similar temporal changes after April 3, 2016, indicating that sVLFE and slow slip event arise from same fault slip.